I bet you didn't think I'd be back this soon. Well, you were wrong! Booyah! I had planned to do great things yesterday. I wanted to get all my homework done, or at least started so that I can relax on Sunday, when I'll be trying out for the Queen's Equestrian Team, and when Anders gets back from his race. Instead, I spent most of the afternoon in front of my computer and then I decided to bake cupcakes and then I spent five hours at the front desk of a residence building keeping my best friend, who works there, company. What this means, though, is that you get another entry and recipe! AND, before I sat down to write this, I did do most of my German homework. So not all is lost. Let's get started though, yes? So, do you remember how I said my chocolate cake recipe is very versatile? And then how I took that recipe and made it into lemon cake? Well, yesterday, I realised that the peaches Anders bought on Tuesday were quickly growing soft and I decided to take that recipe and change it again, to include peaches! 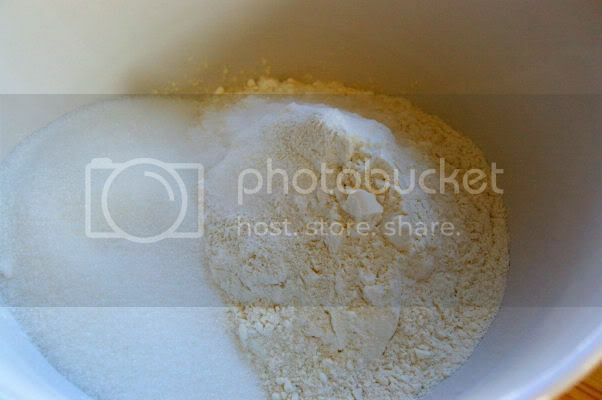 It started with the dry ingredients: flour, sugar, baking powder and baking soda. Once I'd measured that all out, I washed some peaches and cut them up into the blender. This blender rocks. It belongs to Anders' brother, so we're only lucky enough to have it until he comes back to Canada. But I really do love it. 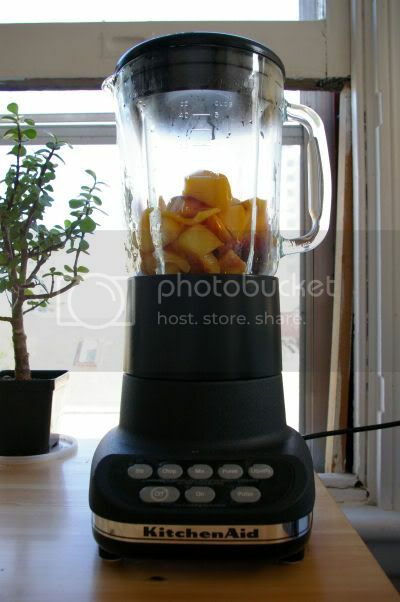 Then I pushed a series of buttons because this blender is super high tech, and the peaches were more of less instantly turned to liquid. Next, I strained the liquefied peaches. The other liquid ingredients consisted of oil and vanilla. I threw everything together in a big bowl, and mixed it up. I ended up having to add some water, because the peach puree was a bit too thick. Also, right before I poured it into the muffin tin, I added some vinegar to activate the baking soda. And then I poured the batter into my lined muffin tin. Twenty minutes later, I pulled them out and they looked and smelled excellent! While they were cooling (on a windowsill, no less! 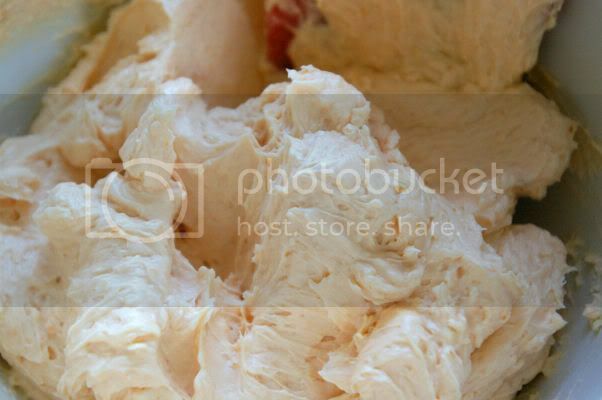 ), I got to work on making some peach buttercream. I started by whipping some room temperature butter. To that, I added a whole bunch of confectioner's sugar. Finally, I added some vanilla and peach puree for flavour. When the cakes were cool, I used a large star tip in my piping bag and piped on the buttercream. Did I mention how much I love my chocolate cake recipe, and how I can pretty much make it into whatever I want? These cupcakes turned out really well. They're extremely moist inside, and while the peach flavour is pretty subtle, they taste great. 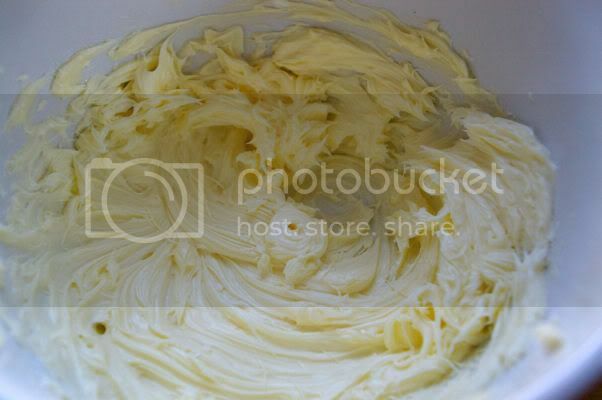 I also love this buttercream icing. It's nice because you can always just omit the cream that it calls for, and use some flavoured liquid instead, which is what I did in this case. The only problem, of course, is that it's very rich, and there's no way to make it even remotely healthy. All in all, though, a nice treat... especially if you have over-ripe peaches sitting around! Oh my gosh, I wish we still had some peaches from my friend's family farm because I so would have made these this weekend. They look beautiful and delicious. So I think I'm going to pick up some peaches tomorrow morning and make this my weekend project. Because these look Divine. Yes, with a capital D.
Quick question before I buy peaches and start gathering ingredients: how many cupcakes does this make? I don't think I saw it in the post. I'm assuming 12, based on pictures and other little hints, but I want to make sure, haha! Sorry! It makes just over 12... like 13 or 14, which is really silly, I know. The recipe I modified to make these is actually a cake recipe, so it is better suited in its original form to a cake pan, and never gives me a normal number of cupcakes. I ended up just eating the rest of the batter... and I didn't write that into my post about it for a reason! These look delicious! I love your piping job for the frosting. How interesting that you're studying German language and literature. I'm thinking of working on Viennese art for my PhD dissertation in art history! But the German language is just sooooo hard for me! This is really original. I love to try this once peach is in season! Yum, everything sounds delicious here. It just so happens that I have peach puree in the frig. Great idea! What gorgeous cupcakes!! 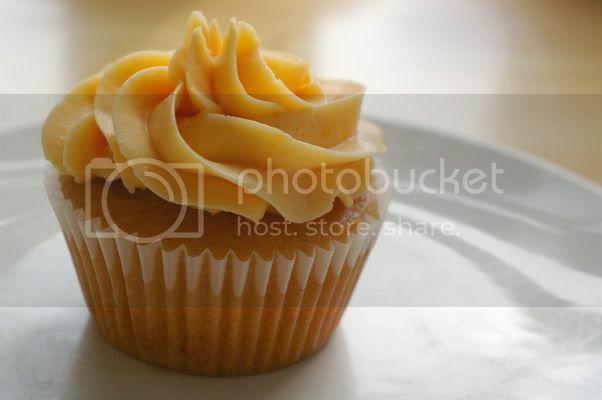 I don't think I've ever had a peach flavored cupcake before, so now I really want one! OMG, they look wonderful! A gorgeous idea! I bet they taste heavenly! These look so pretty. 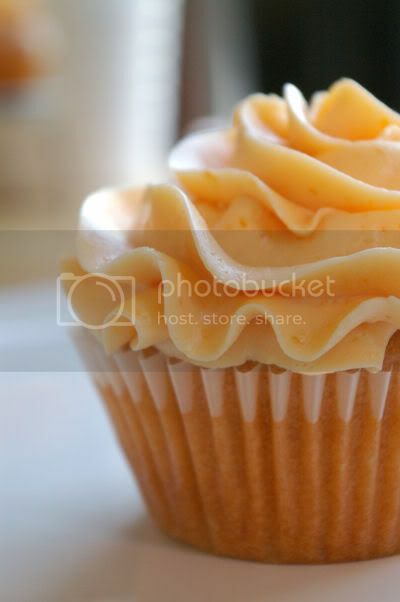 I love the look of the waves of buttercream on top of the cupcake. Cathlin, I love your blog! You're (almost) doing what I wish I could... bake every week! I made your peach cupcakes today, and I have to say, I think yours might have been better... I had a few issues. I used canned peaches and olive oil, for starters, so maybe that's why. But they ended up a bit... I don't know, I guess sticky? The cake stuck to the papers like white on rice, I don't know why. Any suggestions for the next round? Thanks! This recipe sounds amazing. Yours came out beautifully. I can't wait to try them. This recipe sounds absolutely delicious and I will be making it for a party I'm having this weekend, thanks! I love just about everything you post on your blog and it inspires me to get in the kitchen! Keep 'em coming and great job! This recipe looks amazing! 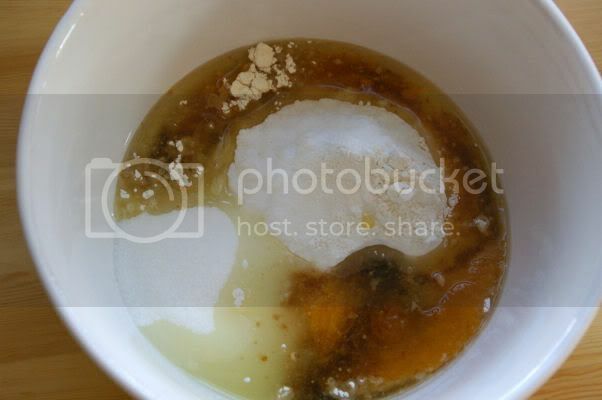 do you think that buttermilk would work in place of the water& vinegar you added? I made these earlier this week for a co-worker's birthday. I followed the recipe to the letter, and they came out HORRIBLE! They were so dense and had NO flavor. Not to mention the frosting tasted like I slapped a stick of butter atop each cupcake. Several fresh picked peaches went to waste. I wish I used a different recipe. Thanks for the post QueenVanessaLynn. I was just about to gather my ingredients and then decided to read the comments. When I get a cupcake recipe off the internet, I only make it for 6 cupcakes, so if it goes bad (which a lot of the times, it does), I'm not out that much...thanks again. Yikes... QueenVanessaLynn, I'm sorry you had such a bad experience with these. When I made these, and whenever I make cupcakes based on this recipe, they come out perfectly - moist, light, fluffy and flavourful. I would appreciate it if you didn't blame it completely on my recipe and come to my blog to say that they are "HORRIBLE." I know you must be frustrated, but it's not a very nice thing to do, and I've had plenty of success with this recipe and ones adapted from it. Again, I'm sorry it didn't work out for you. I just made the cake part of these cupcakes, and I had the opposite experience of QueenieV. They rose beautifully, and are light and lovely. I adapted it - used brown sugar, added a few dashes of ginger, and all I had was apple cider vinegar but wow it made the flavor pop! Glad I didn't have the white. Other than those minor things this recipe is really good! I venture to say you could keep the flour:bs:bp ratios the same and get away with adding more peach puree to make it a little more pungently peach. Came out far better than I anticipated. I am making them again for a party Saturday night. I really dig how this recipe uses no butter or eggs in the cake batter - something I was initially leery of (no egg!?). But you get enough density from the puree, and now I am sold. Good for people watching their cholesterol (cake part), thought they will get their fix from the frosting. A little touch I am going to add to mine are peach salt water taffies on the top of the piping for Saturday. I found them at the store, picked out all the peach flavors. Cathlin, thank you very much. This rocked! I tried these cupcakes and let me just say, they came out very badly. The cake had the consistency of playdough an tasted about the same. However, one mistake I made was that I used canned peaches, instead of fresh ones. That may of been the problem. However, the frosting turned out okay. It tasted great, but it was not very attractive. It was lumpy and looked curdled. I think the problem was that I may have added too much powdered sugar, so it achieved the curdled effect. I add about half a cup of canned frosting, so it would smooth out, and it worked beautifully. Overall, the cake was a bust, but the frosting worked great. -Don't put in too much sugar!!! It's strange - some people had great results with these, others think they're awful! As I mentioned to another commenter, I've messed with this cake recipe soooo very many times and never had a problem at all - and in this particular instance, these cupcakes for extremely fluffy and light. Very strange. Making them right now! Got the cupcakes in the oven. After reading the reviews about not "peachy" enough, I decided to use half peach puree, and half high quality peach preserves. The batter tastes/smells like fresh peaches! 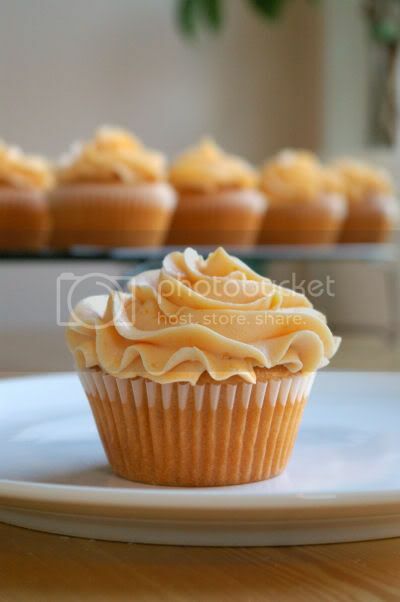 I also plan on using the peach preserves int he buttercream, and filling the cupcakes with homemade vanilla whipped cream to get the peaches and cream cupcake I'm looking for. I have to admit, I've never made a cake without eggs, so that makes me a bit nervous, but I know that vinegar is supposed to do the same thing. I used apple cider vinegar. Guess we'll see how they turn out! Thanks! Nothing says summer like peaches. How many cupcakes does this recipe make? I just made and served these over the weekend. I, too, was not pleased with the texture. The cupcakes were pretty dense -- more of a muffin texture than a light and fluffy cupcake. Any suggestions on how to get them light and fluffy? I followed the instructions to a T. I liked the taste of the cupcakes, though, and the frosting complemented the taste well. Made these cupcakes and they were gross. All I could taste in the cupcakes was the baking soda and baking powder. They did not taste like peach at all, and I used farmers market fresh peaches. The butter cream was good tough. I added more then a 1/4 of peach puree to make it taste like peach. i think it means 2 to 2 1/2 cups? I did 2 cups. I'd suggest making them for yourself first before you make them for anyone else. The are not very good and I followed the recipe to the T.
Need help! I am making them as I type. Your recipe calls for 2/3 cup of water but NOWHERE is water in directions. Where do I add it? Does it go with the peach/vanilla/oil or with the vinegar? You probably won't answer in time, so I flip a coin. Can you clarify? Need help! I'm making these as I type. In the ingredients it calls for 2/3 cup of water but NOWHERE is water called for in the directions. Does it go with the peach/oil/vanilla part or with the vinegar? Since you probably won't answer immediately, I'll flip a coin. Can you clarify? I'm really looking forward to these despite some of the comments. I think the people who had a bad experience missed the water part because it wasn't in the directions. I added the vinegar to the water and poured both in. Let me say these were light and moist. I used peach baby food because I was in a hurry. I think I am going to take the suggestion of another and use peach preserves to give it more peachy flavor. I really wish I would of read the other comments before making these. I just made them and ended up throwing them all out :( so many great fresh peaches and other ingredients wasted. I too found they were more of a muffin texture and just didn't have a good taste. i made some frosting based off of your recipe. your frosting was a great guideline! These cupcake were AWESOME! i live in Utah and the ingredients did fine. Im thinking some of the previous folks forgot the water. Lol. When following the directions it doesnt say to add the water. I used canned peaches and just drained them for awhile. : ). Also in my neck of the woods they took just under 20 minutes to cook. My friends and I are starting a coffee, cupcake cafe and we are looking for amazing recipes- this one made it! My attempt also turned out more muffin like than cupcake like. No complaints! 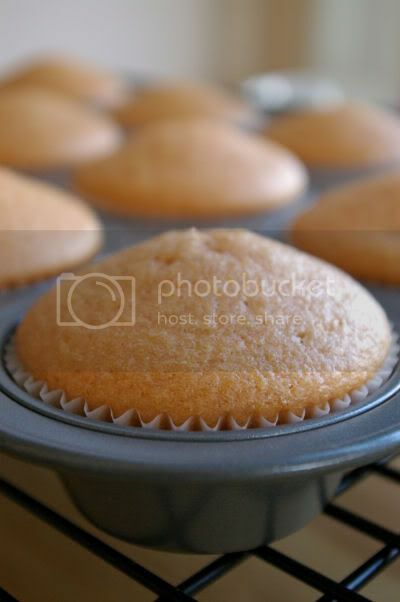 But I think the mix is too sticky for light and airy cupcakes. Also difficult to judge the flour and water to use. obviously "unknown" doesn't know much about baking or she wouldn't have had difficulty with the measurements. why did you leave eggs out of your recipe? Of course they will have the texture of muffins without eggs. I added 2 eggs, left out the vinegar and the cupcakes were fluffy. note to penny- I didn't use water in my batter. This time of year it is difficult to find fresh peaches. 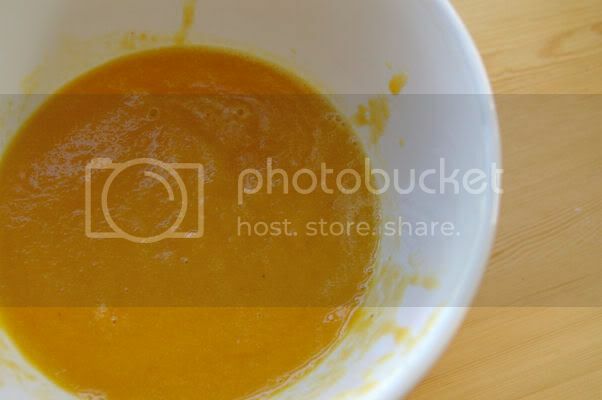 I used canned apricots which puree nicely. I used the juice in place of the water. Not sticky at all. Very light. These were not good. I can't blame the recipe because, yes, there are many variables at play, including the elusive inclusion of water in the directions (I added separately right before the vinegar). The cupcakes themselves were bland and just didn't taste like cupcakes (more muffin-like) and the frosting was meh. Also, it made 24 cupcakes, not 12-14. Oh wow, these look amazing! I found your blog through pinterest. I'd love it if you'd consider doing a guest post over at my The Sweet Details blog! I'd love to have you share one of your recipe! I found your blog in Pinterest, no news there, but I couldn't wait to make these cupcakes for Easter. They seemed so 'Springy'. I don't know how people can make negative comments when clearly then didn't read your directions. The water was to thin the batter if necessary. I added a little extra peach puree that was still in the strainer to the mix and the frosting. I also added 1 Tablespoon of peach schnapps and 1 Tablespoon of Vanilla, rather than 2 Tablespoons of Vanilla. Other than that, I followed your recipe toa tee and the cupcakes are moist, airy, tasty and almost gone!! Thank you and keep up the good work! I have to say after reading the comments, I went ahead and made these with my frozen fresh peaches I picked last season. I'm so glad I did. They were wonderful, just like in the picture. They were moist, flavorful, not too sweet-which in my case is good, cause I don't like sugary sweet stuff. Obviously the ones complaining are not very experienced in the kitchen. Thank you for sharing! Beautiful pics and very creative! Peaches are a nice flavor too - love your blog. Made these cupcakes tonight. They weren't horrible, but they also weren't amazing. They were meh. Cupcake itself was very dense but still somewhat moist (vegetable oil), tasted floury and I couldn't taste the peaches (and I had added extra peach puree). I would definitely have gone with a basic recipe and adapted it to add the peaches, so more flavor could come through. Buttercream frosting was terrible for me. I did not like the flavor and again, would use a different basic recipe and add peaches to it. This is just my personal opinion, and every one has their own taste. This recipe just didn't apply to my preferences. It cooks well, but just the texture and taste were not appealing. However, kudos to Cathlin for sharing the recipe and if you like them, thats all that matters. Doubled the batch for my son's birthday, used fresh peaches and followed the directions. However, the oven temp must have been too hot (375) as all the cupcakes burned on the bottom after 10 minutes. The rest of the cupcake was done beautifully! 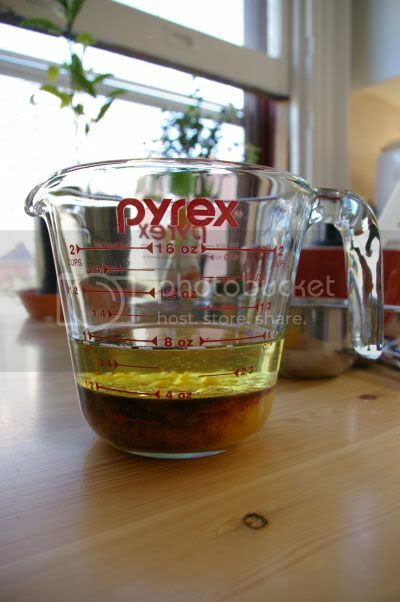 Since you can use apple sauce in place of oil when baking, I wonder how it would work to use more peach puree in place of the oil. If it worked, it would not only be healthier, but have a stronger peach flavor (possible enough so that you could eat without frosting). I did something similar with a apple cupcake recipe that called for using diced apples (and it tasted amazing without frosting). I made these cupcakes yesterday. I made them exactly as written since I always do that before "tweaking" a recipe. The cake itself was soft and fluffy but it seriously lacked a good strong peach flavor that I was looking for. 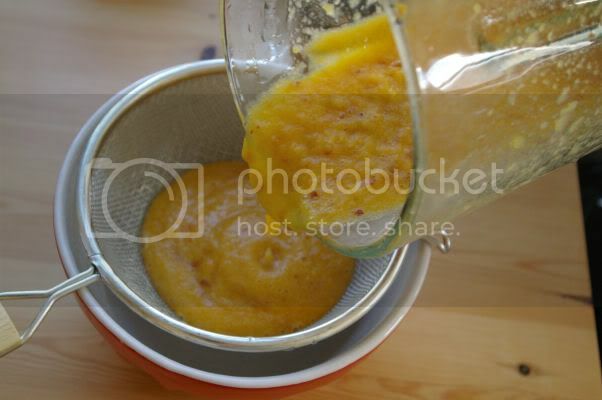 Next time, I think I'll use the peach puree but also put in diced peaches as well. I too was confused about where to put the water, I just added all of it when I put the liquid ingredients into the dry. Mixed it all with a whisk and they turned out beautiful. I got 12 nice cupcakes with a little left over to lick out of the bowl!!! Even with all the negative comments, I decided to make these and I will say they are not terrible but they are not great either. I am a very experienced baker and followed the directions exactly and did add the water and then the vinegar at the end. They are moist but also dense because there are not any eggs. Eggs make thing lite and fluffy! Also the cake is barely sweet and the peach is very subtle. Add an egg or two, little more sugar and no vinegar and they will be great. I love your recipe and tomorrow I'll try it immediately. But what I liked the most was your "Guten Appetit" and then I saw that your studying german language. Dann wünsche ich Dir weiterhin viel Erfolg beim Studium. what do you mean its not healthy!!! there's tons of peaches in there....hahaha! Did not strain the peach puree and added extra to the frosting. I ended up removing the burnt cupcake wrappers and put them in new wrappers to serve. Everyone loved them!! For the cake, I melted the leftover frosting and poured it over the cake (created a glaze). Before serving each piece of the cake, I heated up the leftover peach puree and served a heaping spoon over the cake. Super yummy!!!! Watch what is in the oven and listen to your nose smelling the burning cupcakes even if it IS before the time it says. Use food coloring to brighten up the peach coloring ... looked PEACHY!! When all else fails ... PUNT! I'm not sure what went wrong for other posters but I made these this morning using fresh peach puree and followed the directions exactly except for taking them out of the oven at about 15 minutes instead...the toothpick came out clean! The flavor isn't strongly peach but I prefer it that way...and the buttercream came out perfect too. 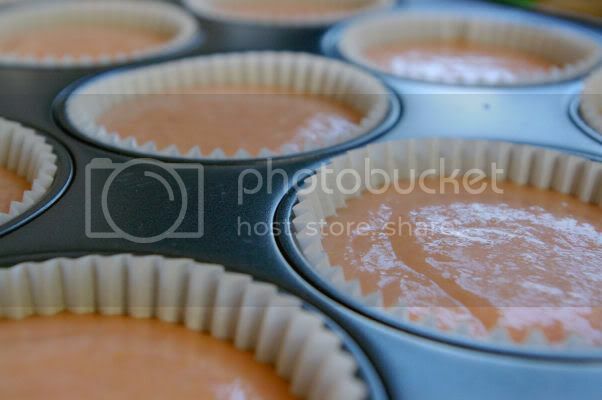 I used "If You Care" unbleached totally chlorine free large baking cups and had absolutely no sticking issues, in fact the paper didn't adhere to the cupcake at all. I'm not someone who generally likes a fresh peach so when I got a few in my FarmFreshRhodeIsland Veggie Box yesterday I knew I'd use them for this recently-pinned recipe, and I'm very happy with how they came out (although I was skeptical about how the vinegar would affect the taste~can't detect it at all!!!). Thank you! I made these but the cake tasted mostly of flour. Not a lot of peach taste to it! I was really disappointed since the picture made my mouth water! Bummer! Hi, I was wondering if you think this would work as a large cake...actually a wedding cake? I am looking for a wonderful cake recipe but want the frosting and filling to be peach flavored! Any ideas? Also, Ive baked with peaches before and have found its hard to keep a strong peach taste after baking. Any ideas there? I'm so sorry for the terribly mean comments! I made this recipe, and while it wasn't the most amazing-tasting to me, that's me! It has nothing to do with you! Everyone has their own preferences. That being said, I altered the recipe to provide a more cake-like texture (with the addition of eggs) and to add some more sweetness and flavor. It turned out incredible. For those of you dissatisfied with the original, try this slightly altered version. You may love it, after all! I absolutely love this recipe! My kids actually love it too, they aren't usually fans of fruit in cakes, but all I could hear were mmmmmmmmmm yummmmmmms!!!!!! Adding in the water called for in the ingredients, but omitted out of the directions makes a HUGE difference. With the water, they are light and airy and taste better. 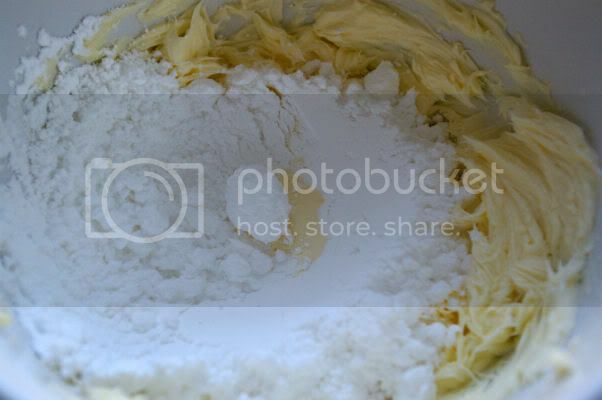 I also used the whisk attachment on my mixer and I think that also helped make them lighter in texture. We enjoyed them. But you do need to add the water. I used 2 cups of flour and with the water and the mixer beating in some air, I got 16 cupcakes. Nice mounded tops too, not flat. I made these today and I must say that they weren't good at all. They were very dense and I couldn't taste the peaches. Before anybody says anything, I am a professional baker and I did add the water. I was looking for a peach cupcake recipe to add to what I offer my customers, but sadly this won't be one of them. 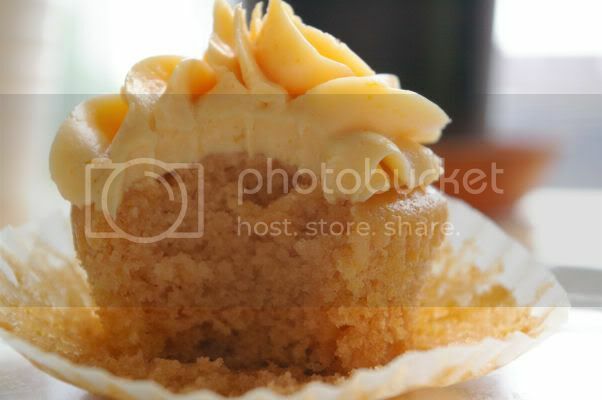 The cupcakes were tasty and fluffy, but lacked any taste of peach without the buttercream. 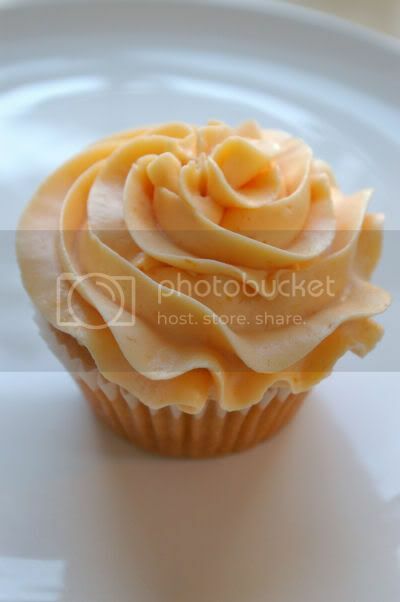 They could not pass for peach cupcakes in that sence. Anyone any ideas that have not already been posted above..? I am French, and I like cooking cupcakes but usually French recipes are not as good as American recipes (for cupcake!). I tried yours two days ago.... It was so so good! Everybody loves them! So just wanted to let you know that your recipe is famous in France! :) Thanks for sharing it! It's my sister's birthday this weekend and she's vegan so I'm making these for her but making the buttercream vegan. It's awesome that I don't have to adjust the cake recipe at all though! I'm so excited for these. Perhaps I'll let you know if it's still as good when it's totally vegan! 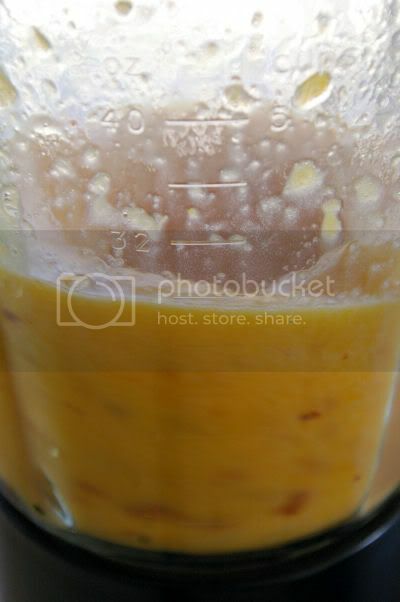 I had some pureed peaches in my freezer and I found this recipe. So I made a cake and it turned out beautifully, even without the peach frosting! Thanks for the recipe. I love that these have no eggs!!! I tried to make these for my peach-loving husband, but I was really disappointed. The cupcake had no flavor at all, but the texture was ok. The frosting was going well until I added the peach puree, then it went grainy and slimy. Don't know what I did wrong! These are so pretty!! Perfect pipping job too! LOL love the way the author has the nerve to chide people who dare to say the recipe wasn't to die for....thanks for the laugh, lady. It was my mom's 50th birthday today and I made these cupcakes for her to take to the restaurant. I couldn't even take them because they were not good at all. It tasted like peach cornbread or something, nothing like a cupcake. NOT SWEET AT ALL. And 2tablespoons of vinegar is entirely too much! The buttercream frosting was amazing. I whipped heavy whipping cream and added it. amazing. Also I enhanced the flavor of the peaches by putting them in the oven for about 10 minutes. Anyway thank you for a great frosting recipe. I’m not a big buttercream fan, but this was definitely one of the top bc recipes I’ve tried. My cupcakes turned out moist and a little dense, but sadly not as flavorful as I hoped. The buttercream frosting is nothing I can pipe and doesn't look all that appetizing although the taste is good. A friend with more cupcake experience than myself suggested that I add more confectioner's sugar; so I'll give that a try tomorrow once I can get to the store and buy some more. Fortunately, these were just an experiment as I had some peaches on hand. I've already eaten two of the 18 that it made. Thanks for the recipe, Cathlin; I was really glad to see an egg-less one! 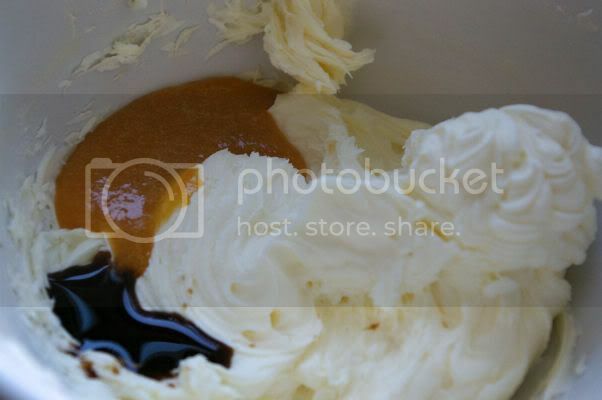 I was confused about the water thing...... my puree seemed to be watery enough... but I don't really know puree standards. My batter looked like bread dough... so I added some water until it looked similar to cake batter. I left half of the recipe kind of thicker than the other half to experiment but there was no difference in baking and both turned out good. Side-note:My batter tastes amazing! My puree is half-strawberries-half-peach! But once baked!... The batter is bland as others have said. The icing was way too runny and an interesting texture.. so I kept adding icing sugar until it resembled thick buttercream. Ahh the water directions I found on others comments, thanks for pointing that out, some of us missed it. I had no problem with pureeing my peaches, but did add two tablespoons of cointreau when I blended them. I also added 2 eggs to this recipe for a better texture and on top of the sugar some aguave nectar, two tablespoons to liven up that batter taste. I could not delete my other comment or I would have. The cake has not come out of the oven yet, but I am going to skip this frosting and use someone else's. Fingers crossed on the cake, but I have a feeling it will be ok.